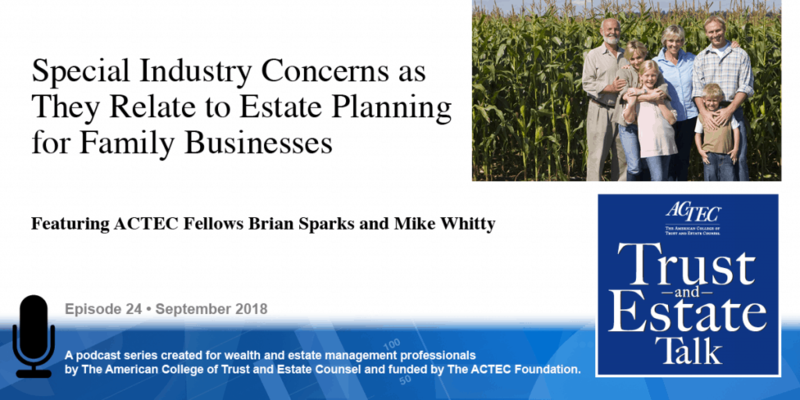 “Special Industry Concerns as They Relate to Estate Planning for Family Businesses.” That’s the subject of today’s ACTEC Trust and Estate Talk. Hi, this is Kevin Matz, ACTEC Fellow from New York City. 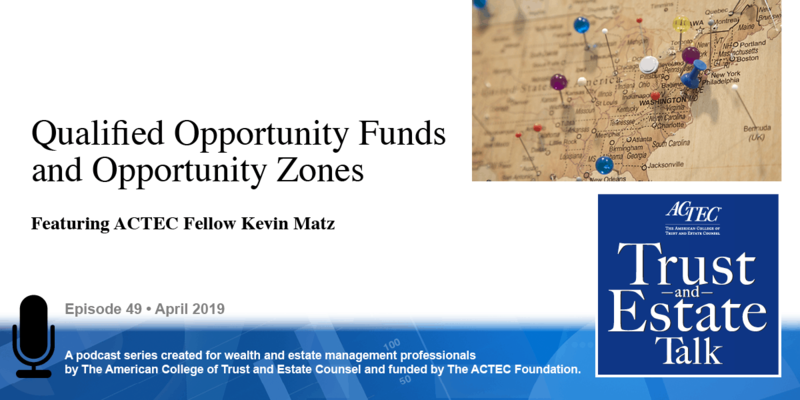 To learn more about this topic, you will be hearing today from ACTEC Fellows Mike Whitty of Chicago and Brian Sparks of Tampa, Florida. Welcome, Mike and Brian. Well, thank you so much, it’s great to be here today, and Mike, let’s get into this. You know we’ve talked before, and we want to talk today about the varieties of clients that we deal with based on the businesses they’re in. Franchisees, dealerships, distributorships, and particularly how third-party control may impact our planning process here, whether it’s from the franchisor, the original equipment manufacturer, and so on. Can you give us some tips on how to address the concerns that arise in these areas? Oh sure, Brian, thank you. First of all, one needs to start with a bit of a different perspective than with an estate plan for somebody who just has financial assets and their own directly owned real estate. In this case, we’re dealing with assets that are very tightly controlled by third parties, and being aware of that control and how to address it is essential when you’re doing planning for the owners of franchises, distributorships, and dealerships. 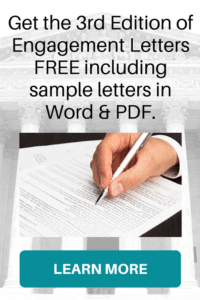 The next step would be to make sure the client understands that this engagement is going to be more expensive than a regular estate plan for people with more traditional assets. And, next, be ready to go and reach out to the general counsel or one of their deputies for the other party. That controlling business that’s over our client if you will. Yes, it could be the franchisor; it could be the original equipment manufacturer. And reach out to them, introduce yourself – and it could very well be that they’ve gone through his routine before for another franchisee or another distributer and it’s not their first rodeo. And they may be able to offer you verbal guidance; they may be able to offer you written guidelines; they may even have a checklist for you. And if you take that approach, you’re going to save yourself some time, you’re going to save them some time, and they’ll appreciate that, and you’ll save your client some money. In other words, in order to understand what they may have already considered before, whether it’s family-limited partnerships or GRATs or different varieties of ownerships and so on. And how they would want to deal with those difficult types of estate planning structures. That’s correct, because if they’ve seen it before, they already know how to deal with it. If you’re proposing something they’ve never seen before, you may have to educate them a bit, and you may have to collaborate on looking at all the relevant operating agreements and controlling agreements so that you can find out how to best merge your plan with their system. If you do find out that there’s no way to do that, it’s better to find out on the front end before you’ve done all the drafting and before you’ve tried to implement things, or maybe even make transfers. Exactly, well put. Well, we usually know our clients best as individuals, because that’s part of the estate planning process, to get very familiar with them, but we may not be as familiar with them as businesses. And, in many cases, you know, we’re going to be dealing with these third-party control factors and so on. What are your thoughts in terms of when to bring in other experts, other lawyers, say a corporate lawyer or business attorney into this process? Well, if it is something or a case where I have a corporate partner in my law firm, I would bring them in fairly early on. I would want them to be in on the meetings where we do the planning as to how to make the transfers of ownership in the entities and also the meetings where we identify the items that are going to be delegated to a corporate associate for review. And then when that corporate associate comes back with their report, I would want the corporate partner there as well. We wouldn’t necessarily need to have the corporate partner engaged in every single meeting, especially those that are primarily focused on the estate-planning aspects of it as opposed to the business-planning aspects. But that collaboration I think is very important whether that corporate lawyer is within your own firm or perhaps in another firm that your client uses. In that context, how far do you like to get into the nitty-gritty of the business corporate details and so on? Obviously I’m sure you want to be there in terms of ownership shifting and the transfer tax implications, and so on, but, when they start talking about a lot of the business-specific issues that come up, how far do you want to stay embedded or in-depth in that versus letting the corporate people handle that? 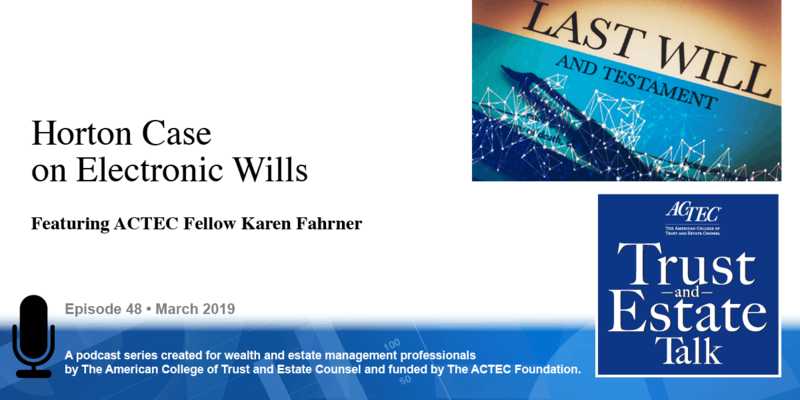 I like to be monitoring it on everything that’s going to have any kind of consequence as to the estate plan, the dispositive part of the estate plan, and also any potential estate or gift tax implications. So, I might, you know, let the corporate attorneys take the lead in documenting the transfer agreements, but I would want to make sure that we weren’t doing anything that might, for example, cause a foot fault or a trip-up with one of the tax rules, such as Chapter 14 of the Internal Revenue Code. Exactly. And of course these third party control, let’s call them organizations, whether it’s a franchisor or the equipment manufacturer and so on. You know, they have a lot of things they’re concerned about. Who owns the business? Who’s going to be owning the business? So they impose things like transfer restrictions, change of control restrictions; sometimes if there’s a financing arrangement either with them or with a third-party bank, there are loan covenants and loan guarantees that come into play, so it can get pretty complicated. The other thing that comes up a lot, of course, with our planning with our clients is they often times want to pass their businesses onto their children, sometimes whether their children want it or not. And often times we have children who are in the business and children who are not in the business, and I know you have some thoughts about, you know, whether we treat them equally or differently. Could you share those with us please? Yes. We do many times see different degrees of participation by the children in a family-held business, it’s really easy when they’re all approximately equally active, although that rarely happens. It’s also very easy when they’re equally inactive, and they don’t really want a part of the business, and the idea is chances are the founder is going to sell the business before death and just pass on financial assets. But when the founder does expect to pass on the business to family members and some are more active than others, it’s really important, I think, not to go with the false premise that everyone needs to be treated equally. Instead, the people who are active in the business should definitely share more of the control, and it’s also possible you may want to break up the business into different components so that the active participating children can have the control over the operating company itself, which is the source of most of the future growth and most of the income. And then the inactive children can be given ownership, some degree of control, over the more passive parts, which might include: the ownership of the land, ownership of the equipment that is then leased to the operating company, and the ownership of intellectual property. These are all things where the inactive children can be assured of a steady cash flow and continued relationship to the family business, but they’re not directly involved, and the active children don’t have to worry about the inactive children looking over their shoulder all the time. Of course something that gets implicated with that is: who’s our client? Is it, you know, the patriarch and the matriarch? Is it the business? Is it the whole family? Is it the kids? And so forth and so on. That’s a really challenging circumstance for us as estate planners for when we’re kind of used to representing the family, and yet, as you described, some of these interests might be divergent, and it’s important for those people to have proper representation for their particular interests as it might be in conflict or in opposition to some of the other family members, particularly on this children level when you’ve got active and inactive children in the business. 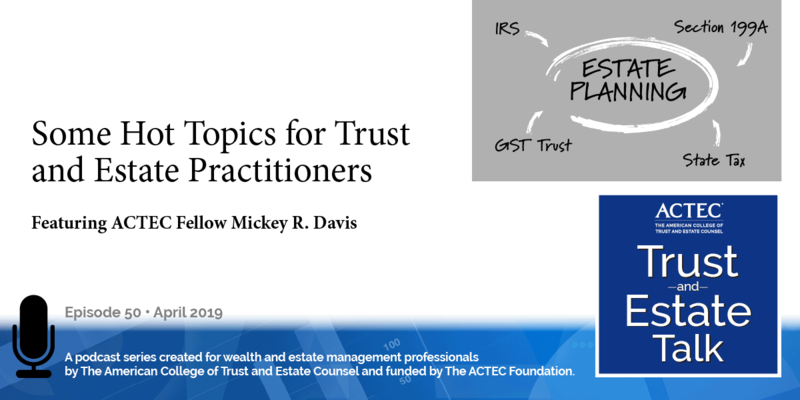 The other thing that I think that’s important here is we’re talking about these different third parties who are involved in trying to control what our clients can do with their businesses is, you alluded to it earlier, what familiarity these third parties, whether it’s a manufacturer, franchisor, or so on – has with our estate planning tools that we like to use, you know, I’ve mentioned to you previously that I ran into a situation where I had a client that was in the banking business; it was a bank, and we had to deal with the federal reserve bank in our region and, to my surprise, while we were trying to transfer interest to a family-limited partnership, they had already dealt with that before and they had their own rules and restrictions that if we had complied with them, they were okay with our client transferring his interest family-limited partnership with our estate-planning motivations behind it. And I know you’ve had experience with that with these other different types of control parties. We do. Other examples might be for the transfer of a gambling license or a liquor distribution license; those all have various restrictions, and I’ve worked with clients to work around those so that they are able to maintain all the different activities they want to have without running afoul with those regulations. Well, and the last thing I wanted to mention was something, Mike, that you brought up to me before and that is that our clients and these third parties do have a common interest, don’t they? And having our client’s business succeed and have continuity and so on, so it’s in everybody’s best interest for this all to work out. But, of course, you know, depending on the size of the arrangement, you know, if there are zillions of franchisees, for example, the willingness of the franchisor to consider some type of special or exceptional aspect is probably going to be more limited than if it’s, you know, if it’s a smaller network. That is correct, the bigger the network, the more experience they will have. Great, thank you very much Mike, it’s been a pleasure to be here, this is Brian Sparks. And thank you, gentlemen, both of you, for your family business expertise.